When you want to put two things together, you often use glue or tape. 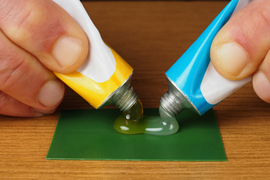 Two pieces of paper will stick together with just a little bit of glue, but you’ll need a stronger glue for other material, like wood or glass. After the glue has dried, the top object (wood, paper, or whatever) is definitely stuck on the other thing. If the glue is good, the top object won’t move. It’s in a new position, and it’s staying there. Being stuck on something, like music or a TV show, also means that a person isn’t moving. A person who is stuck on a band likely has that CD on repeat and isn’t planning on changing his music choice anytime soon. A girl who is stuck on a certain brand of clothing or make-up will always choose the same thing at the store. She knows what her favorite item is, and she’s going to keep using that same thing. Actress Hilary Duff said she is not stuck on some of the music she listens to. She thinks the sound is good, but for her, words are what make a song really good. In order for her to be stuck on a song, the lyrics have to be as good as the the actual music. What are you stuck on? Why is that thing your favorite? stuck on means one track-mind? Think about it all the time and you can't move on. I’m not sure if it’s just a regional thing, because I have heard this used in comercials, but I’m not sure I’ve ever heard anyone say this just talking in daily life. I am stuck on working, When I troubleshooting on problems on my networks. When i have time and feel boring, I would like to watch Asia drama, when i found a good or interesting drama, I am stuck on it. I love cross stitch, when i am making cross stitch, I am stuck on it. because i think those cross stitch are so cute or beautiful and i am very enjoy that i making cross stitch and listening music at the same time..
I’m stuck on running my own wind generation business because of high prices of electricity and heating in Ukraine. I am stuck on swimming but I don’t know how to swim. I stuck on learning English . I’m stuck on shopping shoes. I’m stuck on watching tv series. I’m stuck on a soccer team called Atletico Nacional from Medellin. I think I’m not stuck on anything! I was stuck on learning english here. My husband and I have stuck on the Burberry brand over the past few years. I bought him a watch here for his birthday gift, he bought me a bag for my birthday. I know chrome browser is very popular these days but I’m still stuck on firefox.